Kamiensk was almost entirely destroyed by German artillery fire during the invasion of September 1939. About half of the population fled the town. By the end of 1940, some 350 local Jews and 170 Jewish refugees were living in Kamiensk. During the summer of 1942, their numbers increased to 598 due to the influx of more refugees. In October 1942, some 500 of these Jews were transported to the extermination camp at Treblinka. Several Jews in hiding were handed over by the Poles to the Germans. Kamiensk is mentioned in the following accounts of deportations from the nearby towns of Radomsko and Piotrkow Trybunalski. A letter written by Bela Yoistman, the daughter-in-law of Reb Mendl Yoistman of Kamiensk, to her husband Dovid. The story of the Markzin family of Kamiensk. Account of deportation of Jews of Piotrkow Trybunalski in October, 1942 - includes passage on deportation of Kamiensk Jews to the Piotrkow Trybunalski ghetto. Letter from the Kamiensk Judenrat to "Prezydiem Zydowskiej Samopomocy Spolecznej" in Krakow, dated February 14, 1941 (in Polish); signed by I. Wajnman, uncle of Victor Breitburg. 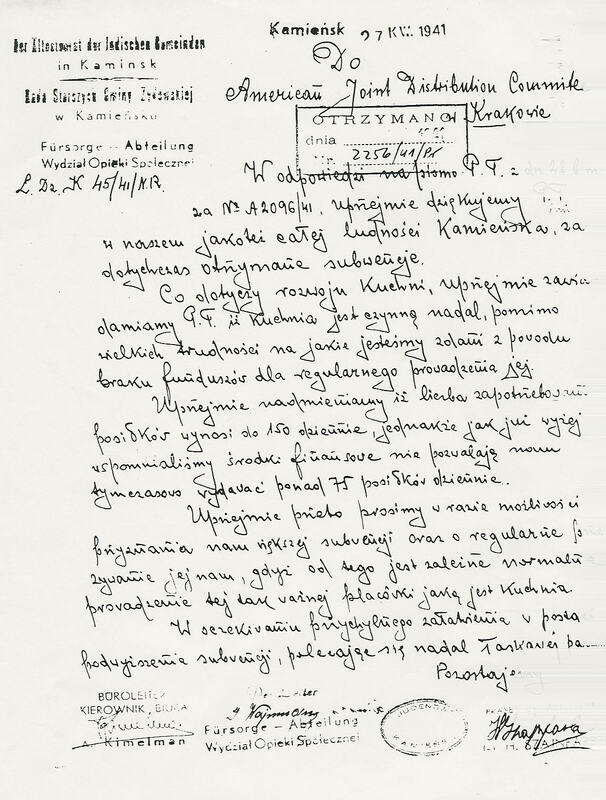 Letter from the Kamiensk Judenrat to "Prezydiem Zydowskiej Samopomocy Spolecznej" in Krakow, dated March 10, 1941(in Polish); signed by I. Wajnman, uncle of Victor Breitburg. 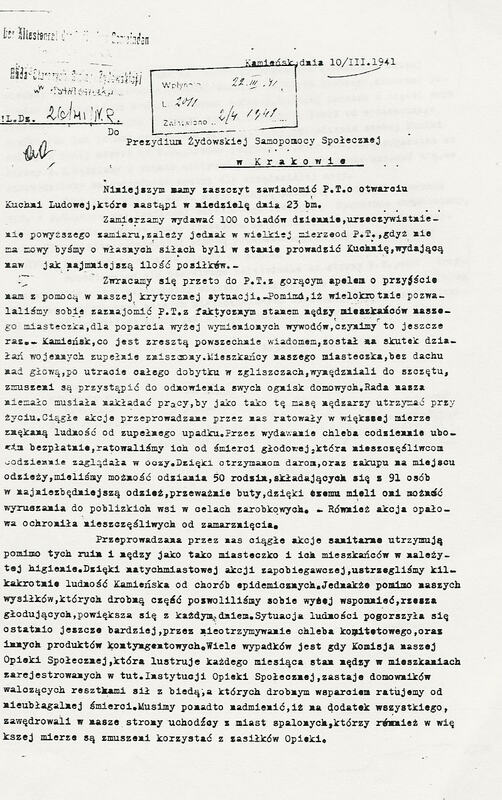 Letter from the Kamiensk Judenrat to the American Joint Distribution Committee in Krakow, dated April 27, 1941 (in Polish); signed by I. Wajnman, uncle of Victor Breitburg. Letter from Kamiensk Judenrat, dated 1941 (in Yiddish); signed by I. Wajnman, uncle of Victor Breitburg. 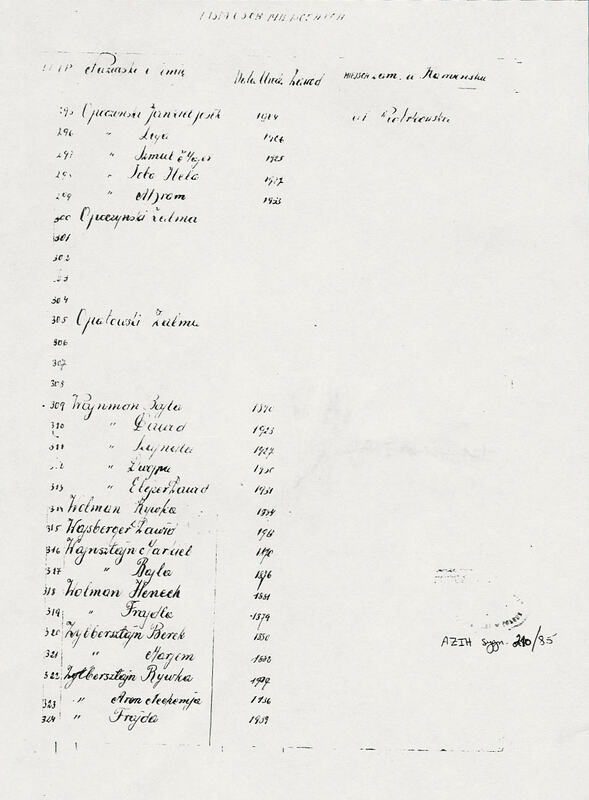 Partial transport list from Kamiensk containing the names of the Wajnman family; additional surnames on this page: Opoczynski, Opatowski, Wajsberger, Wajnsztajn, Wolman, and Zylbersztajn. The information about Kamiensk was obtained from the Museum of Jewish Diaspora in Tel-Aviv, Israel.